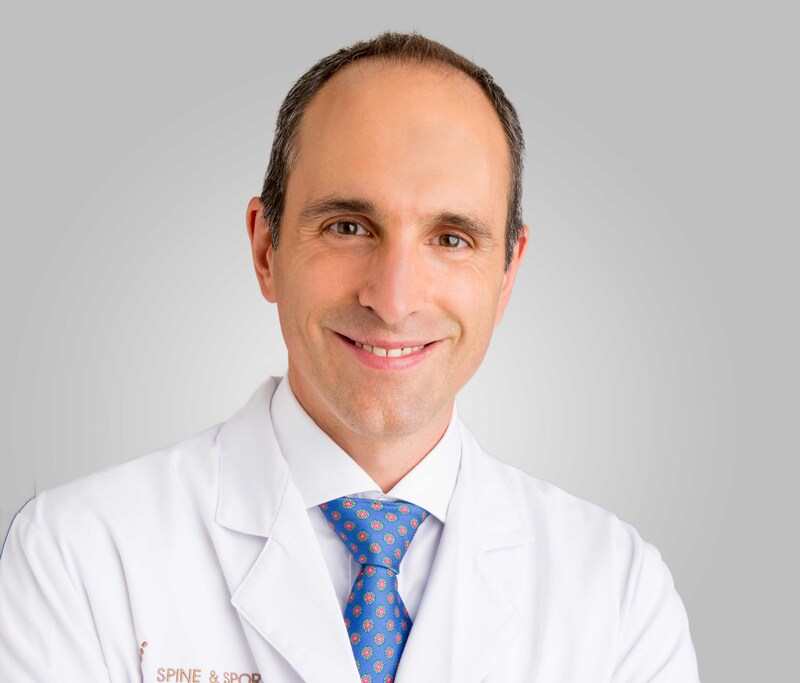 September 20, 2018 By Andre Panagos M.D. Sarcopenia (in Greek, sarx for flesh and penia for loss) is considered, “poverty of the flesh” (Rosenberg, 1997). The term is used to describe the loss of skeletal muscle and progressive weakness that occurs with aging. Sarcopenia is also used to describe the associated changes in the nervous system, endocrine system, levels of inflammation, and body fat distribution, as well as poor nutrition and reduced physical activity that is associated with aging. The most prominent effects are greatly reduced mobility and loss of independence in the older population (Roubenoff, 2000). Sarcopenia may develop as early as 30 years of age when body weight gain and accumulation of fat masks the outward signs of muscle loss (See figure below). Between 30 and 60 years of age, the average adult gains approximately 0.45 kg (1 lb) of fat and loses about 0.23 kg (0.5 lb) of muscle yearly. Loss of muscle mass then accelerates to 2% annually beginning at 60 years of age (Waters, 2010). The rate of muscle loss is variable, with a total muscle cross-sectional area reduction of about 40% between 20 and 60 years of age (Waters, 2010). The prevalence of sarcopenia increases from 13-24% in persons under 70 years of age then skyrockets to >50% in persons over 80 years of age (Baumgartner, 1998). The wide variability in the progression of sarcopenia is affected by age-related systemic changes and lifestyle choices (Rom, 2012). Muscle wasting in a 74 year-old sedentary male and the absence of muscle wasting in a 70 year-old triathlete. The 74 year-old triathlete has muscle mass comparable to the 40 year-old triathlete (Wroblewski, 2011). The simplest view on the development of sarcopenia is explained by loss of muscle mass known as muscle atrophy. This muscle loss is due to physical inactivity that is common in modern life. Certain people that you may know may harbor the early signs of sarcopenia even before the age of 30, although research does not include them in the current definition. The simple absence of stimuli that promotes muscle formation may fundamentally explain age-related muscle loss (Roubenoff, 1999). A sedentary lifestyle with no increased energy expenditure above resting level such as sitting, lying down, and watching television has been shown to be a major risk factor for sarcopenia (Chastin, 2012). Many studies have shown that prolonged periods of bed rest can result in a 30% reduction of muscle volume, particularly in muscles of the lower limbs in (Narici, 2011). It is never too late to reverse age-related muscle decline. A study looking at an eight-week strength training program in the 90-year-old age group demonstrated an over 100% increase in strength from the pre-exercise baseline and a 48% increase in walking speed (Fiatarone, 1990). Another study following a 12-week strength training program of three days a week in older adults resulted in increased muscle strength, muscle tissue hypertrophy, and increased myofibrillar protein turnover (Frontera, 1988). Even a resistance training program of only one day per week in older adults improved muscle strength in a similar manner to a resistance training program of 3 days per week (Taaffe et al. 1999). A progressive resistance training program should be tailored to an individual’s goals. The program should be challenging, not overwhelming, and should be continuously adjusted to stimulate muscle growth. Orange Theory and CrossFit are good examples of programs that promote muscle development in continuously changing workout programs. Before starting any exercise program, it is important to check with your physician. If you are unfamiliar with strength training, starting off with a trainer is a good idea to gain familiarity and ensure safety with the exercises. Resistance training is a form of exercise in which muscle contract against an external load. Examples of resistance training include free weights, exercise machines, body weight exercises, and use of elastic bands. The classic resistance training program to build muscle consists of 8 to 10 exercises that target the major muscle groups, done in sets of 8 t o12 repetitions. The last 2-3 repetitions should be somewhat difficult at about 60% to 80% of a one-repetition maximum. To see changes, it is important to do this program two to three times per week, although in the previous study, even once per week is more beneficial than not participating at all. Some people like to participate in high-intensity interval training (HIIT) which approximates the challenges in life like running for the bus or carrying a sudden heavy load. HIIT allows you to gain the benefits of exercise in a much shorter time frame. Aerobic training, in which large groups of muscle are engaged for a prolonged period of time, is less likely promote increased muscle strength; however, it can increase the cross-sectional area of muscle fibers, mitochondrial volume, and muscle enzyme activity (Rom, 2012). The American College of Sports Medicine and American Heart Association suggest a minimum of two non-consecutive days per week of strength training (Nelson, 2007). Individuals with poor performance initially can achieve improvement even with less frequent training. Side effects are rare, but it is still advisable to review a new exercise program with your physician first especially if you have pre-existing diseases (Burton, 2010). A very important study compared older and younger strength-trained subjects, the maximal isometric torques, the speed of movements, cross-sectional areas of muscle, as well as the content of muscle fibers called myosin and tropomyosin and found them to be identical. These findings suggest that strength training can be used to counteract muscle wasting related to age (Klitgaard, 1990). Sarcopenia is caused by many lifestyle factors. Aging is associated with decreased food intake that has been called the “anorexia of aging” or in younger old population, “skinny fat”. A decrease in food intake is thought to play a critical role in sarcopenia (Morley, 2001). Reduced food intake may be due to living alone with little or no support, a diminished interest in cooking, less hunger and thirst, chewing and swallowing difficulty, digestion problems, and inadequate absorption of nutrients. Food choices are usually less than ideal with a reliance on convenient processed foods which are high in carbohydrate calories and low in healthy proteins, healthy fats, vitamins, and minerals. A similar effect occurs with an excessive caloric intake which leads to obesity, hiding the loss of muscle mass behind the fat called “sarcopenic obesity”. Excessive caloric consumption or storage creates chronic low-level inflammation and metabolic dysfunction which further exacerbates muscle wasting (Plutzky, 2009). Animal protein provides the proper ratio of essential amino acids that are very important for building muscle (Volpi, 2003). Black beans and kidney beans contain similar ratios of essential amino acids except for methionine. Hence rice is consumed for the addition of methionine. The nine essential amino acids that humans cannot synthesize are histidine, isoleucine, leucine, lysine, methionine, phenylalanine, threonine, tryptophan, and valine. But make sure you stay away from processed proteins due to the extra fillers and preservatives. Protein powders may be a good alternative if you have difficulty consuming enough protein daily. Leucine, one of the essential amino acids has been found to be particuarly helpful in preserving muscle mass. Leucine is found in beef, lamb, pork, poultry, fish, dairy products, beans as well as nuts and seeds. Leucine has been found to play an important role in regulating muscle metabolism and is known to prevent muscle wasting (Rom, 2012 #1). A study that increased the proportion of leucine in a mixture of essential amino acids given to older subjects was found to reverse impaired protein synthesis in muscle (Katsanos, 2006). The best protein-rich foods to consider adding to your diet include grass-fed and finished beef, organic chicken, wild fish such as tuna and salmon, organic whey protein, black or kidney beans, fermented dairy such as yogurt, kefir, and natto. Older adults should eat nutritionally dense foods as the absorption of nutrients is usually impaired. Older adults require more protein/kilogram body weight than do younger adults because older adults have lower rates of protein breakdown and synthesis (Nowson, 2015). Following exercise, your muscles are most receptive to nutrition so it is important to consume a drink or meal with some added carbohydrate and protein within 30 minutes of completing an exercise. This helps rehydrate and fuel your muscles to begin the muscle repair process. A 2015 study in The American Journal of Clinical Nutrition found that omega-3 fatty acid supplementation from fish slowed the decline in muscle mass and function in older adults (Smith, 2015). There is a great deal of debate around the modulation of growth hormone levels to promote muscle growth, so physicians have instead begun to assess thyroid and testosterone levels. Older adults are at increased risk of vitamin D insufficiency due to various factors. As people age, the skin’s ability to synthesize vitamin D efficiently is reduced, and the kidney is less able to convert vitamin D to its active form; in addition, inadequate sunlight exposure which is essential for vitamin D synthesis and low consumption of dietary vitamin D are common among the elderly (Dirks-Naylor, 2011). Vitamin D plays an important role in skeletal muscle tissue by maintaining the function of the type II muscle fibers, to preserve muscle strength and prevent falls (Montero-Odasso, 2005). Alcohol impairs muscle protein synthesis. Lab studies have shown that ethanol decreased muscle protein synthesis by up to 75% (Tiernan, 1986). A disease called alcoholic myopathy occurs with pronounced or long-term alcohol intake in individuals with poor dietary intake and usually results in low muscle mass and strength, muscle cramps, gait dysfunction, and falls. If severe, it can result in acute alcoholic myopathy which is characterized by severe muscle pain and kidney failure. Chronic alcoholic myopathy is a common complication of alcoholism affecting approximately 50% of alcohol. Chronic alcoholic myopathy is associated with nutritional deficiencies or liver disease and is reversible within 6–12 months if ethanol intake is discontinued (Preedy, 2001). Smokers have been found to have lower skeletal muscle mass than subjects who never smoked (Szulc, 2004) and accelerated degradation of muscle protein in elderly smokers (Rom, 2012). Baumgartner RN, Koehler KM, Gallagher D, Romero L, Heymsfield SB, Ross RR, Garry PJ, Lindeman RD. Epidemiology of sarcopenia among the elderly in New Mexico. Am J Epidemiol. 1998 Apr 15;147(8):755-63. Erratum in: Am J Epidemiol 1999 Jun 15;149(12):1161. PubMed PMID: 9554417. Burton LA, Sumukadas D. Optimal management of sarcopenia. Clin Interv Aging. 2010 Sep 7;5:217-28. Review. PubMed PMID: 20852669; PubMed Central PMCID: PMC2938029. Chastin SF, Ferriolli E, Stephens NA, Fearon KC, Greig C. Relationship between sedentary behaviour, physical activity, muscle quality and body composition in healthy older adults. Age Ageing. 2012 Jan;41(1):111-4. Doi: 10.1093/ageing/afr075. Epub 2011 Jul 12. PubMed PMID: 21749993. Chernoff R. Protein and older adults. J Am Coll Nutr. 2004 Dec;23(6 Suppl):627S-630S. Review. PubMed PMID: 15640517. Dirks-Naylor AJ, Lennon-Edwards S. The effects of vitamin D on skeletal muscle function and cellular signaling. J Steroid Biochem Mol Biol. 2011 Jul;125(3-5):159-68. doi: 10.1016/j.jsbmb.2011.03.003. Epub 2011 Mar 21. Review. PubMed PMID: 21397021. Doherty TJ. Invited review: Aging and sarcopenia. J Appl Physiol (1985). 2003 Oct;95(4):1717-27. Review. PubMed PMID: 12970377. Ferrucci L, Penninx BW, Volpato S, Harris TB, Bandeen-Roche K, Balfour J, Leveille SG, Fried LP, Md JM. Change in muscle strength explains accelerated decline of physical function in older women with high interleukin-6 serum levels. J Am Geriatr Soc. 2002 Dec;50(12):1947-54. PubMed PMID: 12473005. Fiatarone MA, Marks EC, Ryan ND, Meredith CN, Lipsitz LA, Evans WJ. High-intensity strength training in nonagenarians. Effects on skeletal muscle. JAMA. 1990 Jun 13;263(22):3029-34. PubMed PMID: 2342214. Frontera WR, Meredith CN, O’Reilly KP, Knuttgen HG, Evans WJ. Strength conditioning in older men: skeletal muscle hypertrophy and improved function. J Appl Physiol (1985). 1988 Mar;64(3):1038-44. PubMed PMID: 3366726. Katsanos CS, Kobayashi H, Sheffield-Moore M, Aarsland A, Wolfe RR. A high proportion of leucine is required for optimal stimulation of the rate of muscle protein synthesis by essential amino acids in the elderly. Am J Physiol Endocrinol Metab. 2006 Aug;291(2):E381-7. Epub 2006 Feb 28. PubMed PMID: 16507602. Klitgaard H, Mantoni M, Schiaffino S, Ausoni S, Gorza L, Laurent-Winter C, Schnohr P, Saltin B. Function, morphology and protein expression of ageing skeletal muscle: a cross-sectional study of elderly men with different training backgrounds. Acta Physiol Scand. 1990 Sep;140(1):41-54. PubMed PMID: 2275404. Montero-Odasso M, Duque G. Vitamin D in the aging musculoskeletal system: an authentic strength preserving hormone. Mol Aspects Med. 2005 Jun;26(3):203-19. Review. PubMed PMID: 15811435. Narici MV, de Boer MD. Disuse of the musculoskeletal system in space and on earth. Eur J Appl Physiol. 2011 Mar;111(3):403-20. Doi: 10.1007/s00421-010-1556-x. Epub 2010 Jul 9. Review. PubMed PMID: 20617334. Nelson ME, Rejeski WJ, Blair SN, Duncan PW, Judge JO, King AC, Macera CA, Castaneda-Sceppa C; American College of Sports Medicine; American Heart Association. Physical activity and public health in older adults: recommendation from the American College of Sports Medicine and the American Heart Association. Circulation. 2007 Aug 28;116(9):1094-105. Epub 2007 Aug 1. PubMed PMID: 17671236. Nowson C, O’Connell S. Protein Requirements and Recommendations for Older People: A Review. Nutrients. 2015;7(8):6874-6899. doi:10.3390/nu7085311. Plutzky J. Expansion and contraction: the mighty, mighty fatty acid. Nat Med. 2009 Jun;15(6):618-9. doi: 10.1038/nm0609-618. PubMed PMID: 19498375. Preedy VR, Adachi J, Ueno Y, Ahmed S, Mantle D, Mullatti N, Rajendram R, Peters TJ. Alcoholic skeletal muscle myopathy: definitions, features, contribution of neuropathy, impact and diagnosis. Eur J Neurol. 2001 Nov;8(6):677-87. Review. PubMed PMID: 11784353. Rom O, Kaisari S, Aizenbud D, Reznick AZ. Lifestyle and Sarcopenia—Etiology, Prevention, and Treatment. Barzilai N, ed. Rambam Maimonides Medical Journal. 2012;3(4):e0024. doi:10.5041/RMMJ.10091. Rom O, Kaisari S, Aizenbud D, Reznick AZ. Identification of possible cigarette smoke constituents responsible for muscle catabolism. J Muscle Res Cell Motil. 2012 Aug;33(3-4):199-208. doi: 10.1007/s10974-012-9299-4. Epub 2012 May 22. Review. PubMed PMID: 22614737. Rosenberg IH. Sarcopenia: origins and clinical relevance. J Nutr. 1997 May;127(5 Suppl):990S-991S. doi: 10.1093/jn/127.5.990S. Review. PubMed PMID: 9164280. Roubenoff R. The pathophysiology of wasting in the elderly. J Nutr. 1999 Jan;129(1S Suppl):256S-259S. doi: 10.1093/jn/129.1.256S. Review. PubMed PMID: 9915910. Roubenoff R, Hughes VA. Sarcopenia: current concepts. J Gerontol A Biol Sci Med Sci. 2000 Dec;55(12):M716-24. Review. PubMed PMID: 11129393. Smith GI, Julliand S, Reeds DN, Sinacore DR, Klein S, Mittendorfer B. Fish oil-derived n-3 PUFA therapy increases muscle mass and function in healthy older adults. Am J Clin Nutr. 2015 Jul;102(1):115-22. doi: 10.3945/ajcn.114.105833. Epub 2015 May 20. PubMed PMID: 25994567; PubMed Central PMCID: PMC4480667. Szulc P, Duboeuf F, Marchand F, Delmas PD. Hormonal and lifestyle determinants of appendicular skeletal muscle mass in men: the MINOS study. Am J Clin Nutr. 2004 Aug;80(2):496-503. PubMed PMID: 15277176. Taaffe DR, Duret C, Wheeler S, Marcus R. Once-weekly resistance exercise improves muscle strength and neuromuscular performance in older adults. J Am Geriatr Soc. 1999 Oct;47(10):1208-14. PubMed PMID: 10522954. Tiernan JM, Ward LC. Acute effects of ethanol on protein synthesis in the rat. Alcohol Alcohol. 1986;21(2):171-9. PubMed PMID: 3741552. Volpi E, Kobayashi H, Sheffield-Moore M, Mittendorfer B, Wolfe RR. Essential amino acids are primarily responsible for the amino acid stimulation of muscle protein anabolism in healthy elderly adults. Am J Clin Nutr. 2003 Aug;78(2):250-8. PubMed PMID: 12885705; PubMed Central PMCID: PMC3192452. Waters DL, Baumgartner RN, Garry PJ, Vellas B. Advantages of dietary, exercise-related, and therapeutic interventions to prevent and treat sarcopenia in adult patients: an update. Clin Interv Aging. 2010;7:259–70. http://dx.doi.org/10.2147/CIA.S6920. Wroblewski AP, Amati F, Smiley MA, Goodpaster B, Wright V. Chronic exercise preserves lean muscle mass in masters athletes. Phys Sportsmed. 2011 Sep;39(3):172-8. doi: 10.3810/psm.2011.09.1933. PubMed PMID: 22030953. September 11, 2018 By Andre Panagos M.D. Research into the basic concepts of dehydration still leaves a lot of questions unanswered. The billions of biochemical reactions your body needs to function normally are vitally dependent on the efficient flow of water. Water comprises up to 75% of the total body weight in infants and falls to 55% in the elderly (Hooper 2014). Water makes up 85% of the total weight of the brain (Kleiner 1999). More than half of the water within our body is found in the cells with the remainder in the blood and lymph vessels. Water is required for energy production, digestion, transportation, elimination, and temperature regulation. Water not only allows these biochemical reactions to occur, but it also fills the space in and between cells and is an important part of of the collagen fibers that form the structure of your body. Dehydration is very widespread in society (Begum, 2010). Surveys show that up to 75 percent of Americans don’t drink enough water daily (Ericson, 2013). Eighty-two percent of a sample population and up to 95% of the elderly within a sample in Australia failed to meet adequate intake values for total water intake (Sui 2016). The average total intake of fluid was 1-1.3 liters per day depending on age groups. Water accounted for about one-half of daily fluid intake with the remainder originating from foodstuffs like fruits and vegetables (Bellisle, 2010). The hypothesis is that people lose their thirst sensation beginning as early as 20 years of age. Also, cellular absorption of water from blood vessels also decreases with aging. These two changes results in progressive dehydration starting from early adulthood. A dry mouth or skin tenting on the back of your hand are later signs of dehydration. Dehydration of as little as 2% loss of body weight results in impaired physiological and performance responses (Kleiner 1999). If the body loses one liter of water, function becomes impaired and thirst, flushing, dark-colored urine, dry mouth, fatigue, and weakness occur; if down 5 liters, fatigue and dizziness develop, sweating decreases and the core temperature rises; a loss of 15 liters can lead to muscle spasms, confusion and could be fatal (Kamler, 2005, Rothenberg, 2008). Proper metabolism is dependent on chemical reactions that critically depend on water. The flow of water through the cell membrane and mitochondria creates energy that is stored in the form of adenosine triphosphate (ATP). The hydrogen and oxygen molecules from water (H2O) are used by an enzyme called ATP Synthase to convert the ADP to ATP (Jonckheere, 2012). The mitochondria produce less ATP if there is less intracellular water (Robin, 1976). When a cell does not have enough energy to repair itself, the cell breaks down or ruptures. When it ruptures, enzymes are released that cause inflammation and damage to adjacent cells and tissues (Robin, 1976). Water is important for clearing out toxins, otherwise chronic inflammation develops within the cells which eventually spills over into the blood vessels and the rest of the body. Out of a total water volume in our body of 50 liters, we lose at least 2 liters of water a day from normal daily body maintenance (Kamler, 2005). Water losses via the skin can range from 0.3 liters per hour in sedentary conditions to 2.0 liters per hour in high activity in the heat. 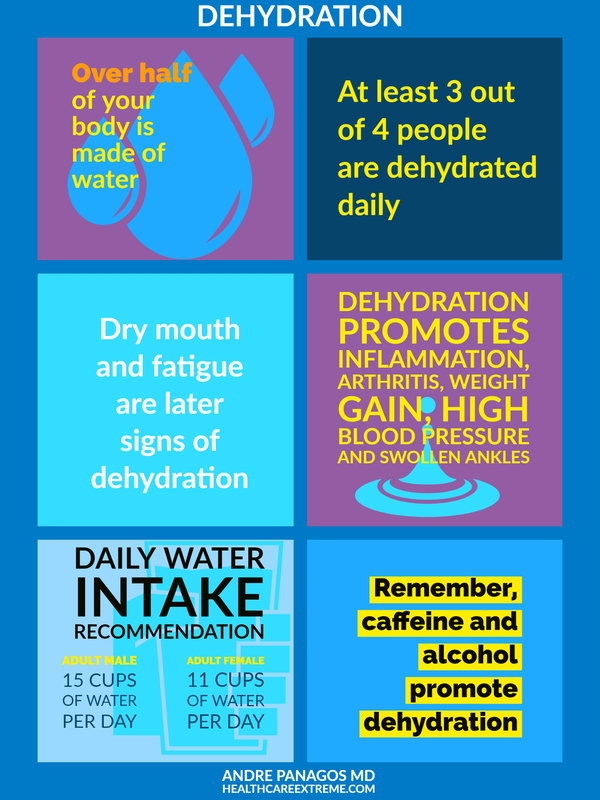 Water intake requirements range from 2.5 liters to slightly over 3 liters per day in adults under normal conditions, and can reach up to 6 liters per day in extremes of heat and activity (Hooper 2014). Simply sitting in a hot climate can cause the body to lose at least 5 liters of water per day. Dehydration appears to have a negative impact on physical performances that are longer than 30 seconds in duration. Exercise performance is impaired even when an individual is dehydrated by as little as 2% of body weight. Even though there is no significant negative impact on tasks lasting less than 15 seconds in duration, a state of proper hydration is suggested to be maintained during all physical activities (Carlton 2015). The capacity to perform high-intensity exercise, which results in exhaustion within a few minutes, is reduced by as much as 45% with pre-activity dehydration (Carlton 2015). Histamine formation and release is directly connected to the concentration and viscosity of internal solutions (Goldstein, 1977). Pain results from local chemical changes in the area surrounding the nerve. When water is not present to clear the cellular metabolic waste, it builds up injuring the surrounding tissues. HIstamine release can also cause symptoms associated with asthma and allergic reactions (Haas, 2008). Thirst is sometimes interpreted by the body as hunger which can lead to overeating (Batmanghelidj, F, 2005). Obese individuals behave in ways that lead them to be inadequately dehydrated. Obese individuals have higher water needs than nonobese individuals, because water needs depend upon metabolic rate, body surface area, and body weight (Chang, 2016). Proper hydration leads to an increase in metabolism from an increase in cell volume and decreased feeding resulting in weight loss. This hypothesis derives from an association between chronic dehydration and raised levels of the hormone angiotensin which is associated with many chronic diseases, such as obesity, diabetes, cancer, and cardiovascular disease (Thornton, 2016). Joint cartilage contains up to 80% water (Sophia Fox, 2009). Water acts as a lubricant which allows the two opposing joint surfaces to glide freely over each other. Water acts as an adhesive material in cellular architecture to keep structures firm and intact. Motion causes cartilage cells to peel away and die but cells underneath take their place. With proper hydration, this friction damage is minimal. With dehydration, there is greater abrasive damage which over time results in osteoarthritis. Exercise creates an intermittent vacuum within the joints allowing fluid and critical nutrients to flow into the joint cavity from the surrounding bone. The Intervertebral joints and discs in the spine are also dependent on the hydraulic properties of water. The majority of the weight of the upper body is supported by the volume of water within the center of each intervertebral disc. The center of the disc, called the nucleus pulposus, forms a natural ball bearing type structure which allows for 360 degrees of motion with little friction. Collagen fibers become stiffer with dehydration (Kemp, 2012) which increases their susceptibility to injury or damage. Structures that do not have direct blood flow, such as the intervertebral discs and joint cartilage are impacted first in chronic dehydration (Wang, 2013). The nerves within the cartilage and soft tissues of the joint increase arterial blood flow resulting in eventual joint swelling (McDougall, 2006). Severe dehydration results in lower leg swelling and water retention because the body increases the extracellular fluid to maintain the fluid within the blood vessels and provide enough to maintain kidney filtration. If more pressure is needed to drive water into the cells this is called hypertension. This process is more efficient when lying horizontally, as the fluid within the legs progresses towards the torso without fighting gravity. Hence the need to go to the bathroom at night with chronic dehydration. This cannot be treated by drinking too much water initially as it may overwhelm the body. Slow increased water intake over time allows the body to rehydrate. High cholesterol is a defense mechanism that protects cells from dehydration (Campbell, 1994). The waxy fatty layer prevents water from leaving the cell and concentrated blood prevents the diffusion of water into the cell. If you do not drink water before you eat, food digestion will injure the cells in the blood vessels and gastrointestinal tract. Water is required for food digestion including the production of hydrochloric acid to break down food. If you have a history of heartburn, it may be caused by too little hydrochloric acid in the stomach which does not completely close the lower esophageal sphincter (Tsoukali, 2103). The liver also needs water to process the components of the food. Following a meal, the cells of the large blood vessels, heart and brain that are first exposed to the highly concentrated viscous blood are the large blood vessels and capillaries of the heart and brain. So cells need to protect themselves from this damage. The body will make less cholesterol if the cells remain fully hydrated (Campbell, 1994). About 20% of blood circulation is used by the brain. The brain uses glucose for energy. The body maintains normal plasma glucose levels by either stimulating appetite or converting stored starch and proteins into sugar by a liver process called gluconeogenesis. The body needs muscle activity to maintain normal function. If brain requires more energy (used more, or in times of stress) and the body is not used proportionally to supply the brain with sugar needs, a person will eat larger quantities of food more often and if the muscles are not active become stored as fat. With increased water, this storage does not happen. With stress, the body becomes dehydrated and initially draws water from inside the cells to make up the deficit. The renin-angiotensin system is activated to retain water and promote the absorption of salt in the presence of dehydration. It also tightens the capillary beds and overall vascular system until all tissues are well-hydrated. Tightening the vessels increases the pressure within the vessels resulting in a condition known as hypertension. Exercise causes relaxation of these blood vessels which results in greater capillary volume which can lower blood pressure. With any stress, the body uses water to break down protein, glycogen, and fats to create energy. If there is pre existing kidney damage, the kidneys have to work harder to filter the blood which causes greater kidney damage. If this process continues over years, the result can be kidney failure (Hooper 2014). Use a carbon filter system or reverse osmosis system to remove pesticides, chlorine, fluoride, and heavy metals. Beware distilled water as it will pull electrolytes out of you body. Use a system that specifically removes fluoride as there is conflicting information about its safety. Chlorine is a gas and it can evaporate from a glass of water after it is left to stand for 30 minutes. We get water not only directly as a beverage but from food as well, with fruits and vegetables containing the most water content (Hooper 2014). It is important not to drink too much water. 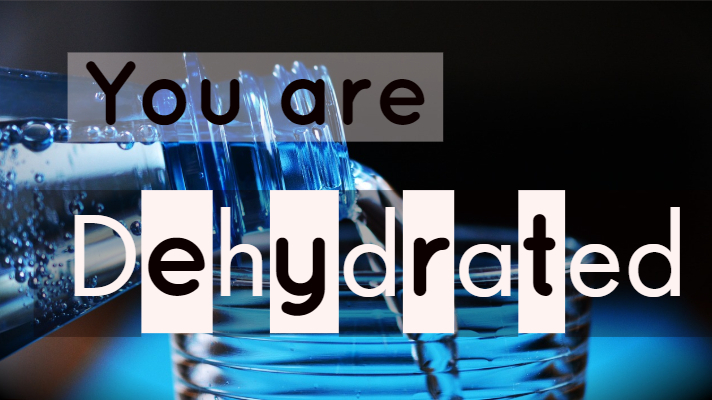 Over hydration can be dangerous by diluting your blood electrolytes which can cause a condition called hyponatremia. Hyponatremia happens most often in endurance races such as marathons in individuals who drink too much water during the race (Rothenberg, 2008). Proper hydration results in colorless urine. It is important to supplement drinks with additional salt or electrolyte solution when excessive sweating is experienced (Hooper 2014). Salt is thought to be a strong antihistamine (Batmanghelidj, 2005). Salt is also very important for the the kidneys for water filtration. Some researchers believe that osteoporosis is due to a shortage of water and salt within the body (Granke, 2015). Approximately 27% of the salt content within the body is stored in bone. The salt is used to strengthen the bones. Unrefined sea salt is a better choice as it also contains trace elements. You need approximately 3 g of salt (half a teaspoon) per 10 glasses of water per day. Exercise and sweating as well as hot climates require greater salt intake. Check with your doctor if you have kidney disease or heart failure before increasing salt intake. If you feel that your skin or ankles are beginning to swell, reduce salt intake and increase water intake for several days until the swelling disappears. You should also increase your muscle activity and not stand or sit in one position for too long. To maintain proper hydration, the average sedentary adult male must consume at least 3 liters (12 cups) of fluid per day, and the average sedentary adult woman at least 2.2 liters (9 cups) of fluid per day, in the form of non-caffeinated, non-alcoholic beverages, soups, and foods (Kleiner 1999). The current guidelines for water intake according to the Institute of Medicine adequate intake standards are higher at 3.7 liters (15 cups) per day for adult men and 2.7 liters (11 cups) per day for adult women (Chang, 2016). One to three glasses 30 minutes before a meal, One to two glass two and a half hours after each meal. Thirst should always be satisfied. The thirst mechanism becomes more efficient with increased water intake. Drinking at least one glass of water 30 minutes before a meal prevents the blood from becoming too concentrated due to food intake. Concentrated blood draws water from the cells. It takes much longer to rehydrate with increasing age (Phillips, 1984). Overweight people should drink half an ounce of water per pound of body weight divided per day (Chang, 2016). An athlete training in a warm environment can lose 1.5 liters per hour. The goal is to stay within 2% of your pre-exercise body weight. You should drink every 10-15 min when exercising. Plan on replacing two cups of fluid for every pound lost, or half a cup every 10-20 min. A large volume of fluid such as ½ liter (2 cups) should be consumed immediately after exercise, with ¼ liter (one cup) of fluid every 15 minutes until at the pre-exercise body weight. Fluid should contain carbohydrate (return stored glycogen to the muscles) and trace minerals or sea salt. Avoid coffee, tea, soda, chocolate as they increase water loss. Urine should be clear. (Benardot, 2000). The easy way to titrate your electrolyte intake is by your bowel movements. If you start to develop loose stools when you’re adding electrolytes, you’re probably over your natural limit. Start by drinking ½ cup of water every 30 minutes from about 7am to 7pm. Add electrolytes to every other dose. Then they can remove what they need to before they go to sleep 2-3 hours later. (Mercola, 2018). Exercise increases muscle mass resulting in an increase in the body’s ability to maintain a water reserve (Bak, 2016). Exercise also promotes joint motion which protects the cartilage layer and the tissues within the joint. Chronic and severe dehydration from regular intake of caffeine and alcoholic beverages increases histamine secretion along the lining of the nerves promoting inflammation and damaging the local cells. Excess caffeine depletes ATP-stored energy. Dehydration is the most important stressor in the body. Caffeine has addictive properties in the brain and acts as a diuretic and a dehydrating agent. Many people drink several cans of soda and never feel fully satisfied as they become dehydrated. People confuse the feeling of thirst with hunger and end up eating more food. Caffeine lowers the threshold of control of the stored ATP energy. The sugar in soda satisfies some of the brain’s requirement for energy. Batmanghelidj, F. Your Body’s Many Cries for Water: a Revolutionary Natural Way to Prevent Illness and Restore Good Health. Tagman, 2005. Begum MN, Johnson CS. A review of the literature on dehydration in the institutionalized elderly. e-SPEN, the European e-Journal of Clinical Nutrition and Metabolism 5 (2010) e47–e53. Bellisle F, Thornton SN, Hébel P, Denizeau M, Tahiri M. A study of fluid intake from beverages in a sample of healthy French children, adolescents and adults. Eur J Clin Nutr. 2010 Apr;64(4):350-5. doi: 10.1038/ejcn.2010.4. Epub 2010 Feb 17. PubMed PMID: 20160751; PubMed Central PMCID: PMC2857162. Benardot D. Nutrition for Serious Athletes. Human Kinetics, 2000. Campbell NR, Wickert W, Magner P, Shumak SL. Dehydration during fasting increases serum lipids and lipoproteins. Clin Invest Med. 1994 Dec;17(6):570-6. PubMed PMID: 7895421. Carlton A, Orr R. (2015). The effects of fluid loss on physical performance: A critical review. Journal of Sport and Health Science, 4(4), 357-363. Chang T, Ravi N, Plegue MA, Sonneville KR, Davis MM. Inadequate Hydration, BMI, and Obesity Among US Adults: NHANES 2009–2012. Annals of Family Medicine. 2016;14(4):320-324. doi:10.1370/afm.1951. “The ‘Drink More Water’ Myth, a Big Chunk of the Truth Is Missing.” Mercola.com, Mercola.com, articles.mercola.com/sites/articles/archive/2018/05/06/how-to-hydrate-at-the-cellular-level.aspx. Goldstein DJ, Halperin JA. Mast cell histamine and cell dehydration thirst. Nature. 1977 May 19;267(5608):250-2. PubMed PMID: 405619. Granke M, Does MD, Nyman JS. The Role of Water Compartments in the Material Properties of Cortical Bone. Calcif Tissue Int. 2015 Sep;97(3):292-307. Doi: 10.1007/s00223-015-9977-5. Epub 2015 Mar 18. Review. PubMed PMID: 25783011; PubMed Central PMCID: PMC4526331. Hooper L, Bunn D, Jimoh FO, Fairweather-Tait SJ. Water-loss dehydration and aging. Mech Ageing Dev. 2014 Mar-Apr;136-137:50-8. doi: 10.1016/j.mad.2013.11.009. Epub 2013 Dec 9. Review. PubMed PMID: 24333321. Jonckheere AI, Smeitink JAM, Rodenburg RJT. Mitochondrial ATP synthase: architecture, function and pathology. Journal of Inherited Metabolic Disease. 2012;35(2):211-225. doi:10.1007/s10545-011-9382-9. Kamler K. Surviving the Extremes: What Happens to the Body and Mind at the Limits of Human Endurance. Penguin Books, 2005. Kemp AD, Harding CC, Cabral WA, Marini JC, Wallace JM. Effects of tissue hydration on nanoscale structural morphology and mechanics of individual Type I collagen fibrils in the Brtl mouse model of Osteogenesis Imperfecta. J Struct Biol. 2012 Dec;180(3):428-38. doi: 10.1016/j.jsb.2012.09.012. Epub 2012 Oct 4. PubMed PMID: 23041293; PubMed Central PMCID: PMC3685442. McDougall JJ. Arthritis and Pain. Neurogenic origin of joint pain. Arthritis Research & Therapy. 2006;8(6):220. doi:10.1186/ar2069. Owen JA. (2015) Dehydration: assessment techniques and effects on endurance performance and well-being. PhD thesis, Prifysgol Bangor University. Phillips PA, Rolls BJ, Ledingham JG, Forsling ML, Morton JJ, Crowe MJ, Wollner L. Reduced thirst after water deprivation in healthy elderly men. N Engl J Med. 1984 Sep 20;311(12):753-9. Robin ED, Theodore J. Intracellular and subcellular oedema and dehydration. Ciba Found Symp. 1976;(38):273-89. PubMed PMID: 1047640. Rothenberg JA, Panagos A. Musculoskeletal performance and hydration status. Curr Rev Musculoskelet Med. 2008 Jun;1(2):131-6. doi: 10.1007/s12178-008-9020-9. PubMed PMID: 19468886; PubMed Central PMCID: PMC2684208. Sophia Fox AJ, Bedi A, Rodeo SA. The Basic Science of Articular Cartilage: Structure, Composition, and Function. Sports Health. 2009;1(6):461-468. doi:10.1177/1941738109350438. Sui Z, Zheng M, Zhang M, Rangan A. Water and Beverage Consumption: Analysis of the Australian 2011-2012 National Nutrition and Physical Activity Survey. Nutrients. 2016 Oct 26;8(11). pii: E678. PubMed PMID: 27792184; PubMed Central PMCID: PMC5133066. Thornton SN. Increased Hydration Can Be Associated with Weight Loss. Frontiers in Nutrition. 2016;3:18. doi:10.3389/fnut.2016.00018. Tsoukali E, Sifrim D. Investigation of extraesophageal gastroesophageal reflux disease. Annals of Gastroenterology : Quarterly Publication of the Hellenic Society of Gastroenterology. 2013;26(4):290-295. Wang Q, Yang Y-Y, Niu H-J, Zhang W-J, Feng Q-J, Chen W-F. An ultrasound study of altered hydration behaviour of proteoglycan-degraded articular cartilage. BMC Musculoskeletal Disorders. 2013;14:289. doi:10.1186/1471-2474-14-289.